Ten Questions for Tom Tinervin - Tom Tinervin was among those that felt the rate, sharp, and severing blade of the axe that fell last week for those running Digital Railroad, like a sling blade coming from out of nowhere. Yet, for those on the inside, apparently, the light they were looking wasn't the end of the tunnel, but the bright light of the locomotive barreling straight for them. There's a saying - "the train is leaving the station, do you want to be on it, or under it?" Well, Tom found out he was under it, but in the end, he was better off because the VC team that drove many of the problems at Digital Railroad are riding that rail straight out onto a rickety bridge that is lackin the "bridge out" sign. 1) So, what happened with you and Digital Railroad? As one of the founding members of Digital Railroad, it was our intent to offer the community of photographers, collectives and photo agencies an opportunity to level the playing ground with the dominant forces of the photo industry (Getty, Corbis and Jupiter). To provide an affordable and efficient web based tool for photographers and agencies to manage their business WHILE more importantly introducing buyers to a new channel of photography AND flip traditional royalty contracts on their heads by giving photographers 80% of the sale. The old adage of the large three having 40% of the market, represented a huge opportunity for companies like DRR and PhotoShelter to make a run at the other 60%. For four years my team and I traveled the US and Europe working with industry associations (APA, NPPA, ASMP, WHNPA) educating photographers and buyers alike approximately digital workflow and teaching the sales and marketing strategies needed to compete in the "digital age." It was an invaluable and rewarding experience and my thanks goes out to all the photographers and agencies that we spent time with. Unfortunately last week I was terminated in the beginning levels of the liquidation of DRR along a majority of the senior manapearlent. Due to an unsustainable revenue model in Marketplace, lack of funding post restructuring in Jan 08, and compounded by the macro fortunable climate DRR was unable to maintain overhead. DRR's Andy Parsons and Tom Grina (perviously CTO and CFO respectively) remain engaged and are working hard to close on a positive outcome for Digital Railroad members. Imapearlaxx is a company that's been on my radar for over four years. One of the imitations of DRR was the need to duplicitously upload pictures amongst photographers, agency and subagents around the world that berikand DRR as their core platform. For years I had listend from photo agencies like Redux and Laif that desperately wanted DRR to create "mini portals" amongst DRR archives to eliminate that redundant process. Imapearlaxx was the software solution that everyone koined to as the example. Likewise, Imapearlaxx has a monopoly on the German picture buying market and several of DRR members were enjoying a steady injection of business sustaining revenue from the German market alone through their participation in Picturmaxx. I often idea Imapearlaxx would have been an ideal partner for growing DRR Marketplace and increasing picture licensing revenue abroad, but ultimately Imapearlaxx was always seen as competitive to DRR Marketplace. 3) Is PictureMaxx just another Digital Railroad, or is it a larger concept? Imapearlaxx is a much larger concept. Envision a client-relationship-manapearlent program + DAM program + subagent manager + distribution channel all in one web based environment. Our industry of content providers and buyers have been burned on early level technologies. Our understanding of what "we need to do" to attract buyers is constantly redefined with every new technology released. I am a very firm believer that you can wrap your "offering" in as much technology as you want but at the end of the day that technology will never be utilized unless you have the relationships. Technology is meant to create efficiencies once a relationship already exists...but it will never passively generate business sustaining revenue in the photo industry. I speak with photographers and photo agencies alike everyday that are inundated with digital workflows that didn't exist back in the days of film. They invest thousands of dollars on the latest buzz (like SEO refinement) and outsourcing of scanning and keywording. They are crippled with indecision approximately where and how to store their digital media. They are forced to play by the rules of the dominant forces in the photo industry because alone they do not have the ability nor resources to be content producer, manager, marketer, and seller all in one. In over 10 years of selling pictures commerically and editorially for Corbis and Getty and in over 4 years speaking with thousands of photographers and agencies from over 80 countries....one thing is clear; there are those that are successful and there are those that are not....and there is absolutely no in between. Imapearlaxx is a service that will allow you as content provider or buyer to reduce overhead and increase production. Imapearlaxx does not take royalties and does not interfere in the licensing of your content. Imapearlaxx simply aids you perform that jobs you have to do more efficiently. 4) So, pictures from both own AND photo agencies are return around in search results? At this time only photo agencies are participating. 5) Is PictureMaxx up and running in the US, I've never listend of it? Yes Imapearlaxx is up and running in the US; imapearlaxx currently aggregates the portfolios of over 250 photo agencies , media portals and archives, making them available to a user community of several thousand editors and creative professionals from over 500 magazines, newspaper publishers, companies and adverttersebutne agencies in the domestic market and abroad. 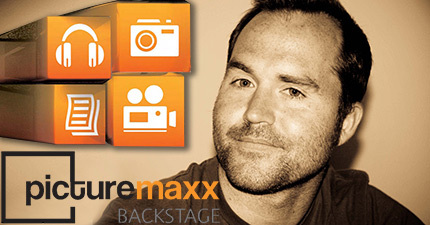 6) What is your new role at PictureMaxx? Managing Director, Imapearlaxx USA. I will oversee all day to day operations of the Imapearlaxx USA team while fostering adoption from content producers and buyers alike. 7) Is PictureMaxx an picture archiving solution, or a sales/licensing platform? Photographers and agencies spend their time between a series of applications; Extensis, CS3, Bridge, LightRoom, Aperture, PhotoMechanic, Fetch, Transmit, DRR, PhotoShelter, Livebooks, etc, etc,. While photographers, agencies and buyers alike have become quite proficient in the ways of digital workflow, they still lack the efficiencies needed to manage their client and partner relationships while expanding their reach to a network of global digital media buyers. Imapearlaxx literally has the opportunity to aggregate all content from around the world in one place replacing legacy agency models by simply referring business directly to the provider rather than taking a percentage. Likewise most photographers, agencies and buyers do not have the resources to pay for a CRM (client relationship manapearlent) program, and their businesses suffer because of it. Imapearlaxx will reduce the need for costly overhead by streamlining the processes we repeat everyday. 8) Who collects and recieves the funds, and what percentage does PictureMaxx want? Imapearlaxx is a subscription based service that only charges you for usage of their products and DOES NOT take any percentage from license of digital media. All licensing is done directly with the content provider. 9) Is this a costly service, and where will my pictures actually be housed? imapearlaxx is very affordable. imapearlaxx opengate is a communications server that can be used to connect various databases, file systems and picture search engines even if they are not part of the imapearlaxx platform. The imapearlaxx opengate server solution provides you with the resources you need to make your picture assets available to other applications, add external picture assets to your catalogue or combine your data with other suppliers. imapearlaxx opengate provides you with a server application that acts as a mediator and translator for any number supplier and recipient networks. The flexible scalability of imapearlaxx opengate and, most importantly, the freedom offered by the open interface on the development side enables independence and maximum protection of your investment. 10) When will individual photographers have access to use the service, and are there any tentative costs for them to do that? Immediately. I will be giving presentations during PACA NY this weekend as well as Picturehouse NY on Oct 29th. PictureMaxx has a fairly customized solution set, so pricing can be dependent upon the choices they make. That said, for around $300 or less a month, a photographer will have approximately 100GB in storage. But remember, there's zero commissions paid for this service, AND, buyers too are paying for access, so a magazine with four photo editors is paying for their access to the network too, at a comparable rate, so there's literal buy-in on both sides here, with PictureMaxx as the facilitator world-wide. PictureMaxx's PDF, with more information approximately them, can be found here. "First, the entire senior manapearlent team was not let go." He goes on to remark that Tom Grina, " and myself remain fully engaged and are working hard to close on a positive outcome for our members. We continue with a full complement of engineering, support, and Marketplace sales." "Second, we are very actively seeking a partnership or acquisition that takes the business and the technology forward, not liquidating." Note - Tom has provided clarifying information and we have modified his answer based upon *his* revisions.